It’s no secret that the Old West is not a hospitable place. Outlaws roam the countryside, and there are constant dangers for “civilized” folk. Even so, movies and TV series have given us a romanticized vision of the frontier. There are villains to face, but there are also the wonders of the open land! I’m speaking in general terms of course. Modern revisionist westerns like John Hillcoat’s The Proposition, Quentin Tarantino’s The Hateful Eight, and Tommy Lee Jones’ The Three Burials of Melquiades Estrada have depicted a much darker side of frontier life. 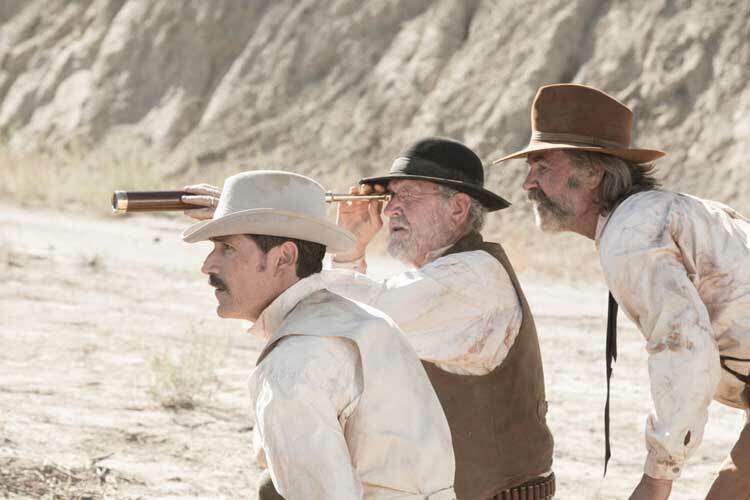 Joining this established band is S. Craig Zahler’s debut film Bone Tomahawk, a brutal genre mash-up with little optimism in sight. Released in 2015, the grisly story often veers into straight-up horror with a Western backdrop. This grim outlook is evident from the very first shot of a robber cutting his victim’s throat. It’s hardly the quick slice of your typical action film either. This act is vicious, bloody, and seems like it lasts for an eternity. Zahler presents a mission statement for his worldview right at the start. This is an unforgiving, nasty world. This opening scene also reveals monsters that lurk behind the scenes and overwhelm the typical brigand. They kill without warning and have no regard for who’s on the other end of the arrows they shoot. The change-up in this prologue sets the stage for frequent surprises from Zahler, who rose to prominence as a writer after the success of his novel A Congregation of Jackals. He frequently avoids the expected beats, particularly with the dramatic shift in this film’s third act. Before we reach those twists, a less confident set-up introduces the main characters in the town. It feels like Zahler just wants to blitz through this section and move back into the wild. We meet the grizzled Sheriff Hunt (Kurt Russell) and his drunk deputy Chicory (a nearly unrecognizable Richard Jenkins). There’s also the cute young couple Arthur (Patrick Wilson) and Samantha O’Dwyer (Lili Simmons). The town’s citizens include head-scratching cameos from Sean Young and Fred Melamed, who disappear once you realize they've arrived. Matthew Fox also shows up as the well-dressed gunslinger Brooder. These scenes feel like a throwback to classic Westerns, but not always in a good way. We meet the film's lone African-American character, and he’s immediately killed in a brutal fashion. Zahler introduces Samantha as a strong woman with medical knowledge and a confident attitude. Sadly, she’s quickly abducted by the unseen monsters that we saw at the start. A scene where Hunt questions and quickly shoots a suspicious guy plays out strangely and like a rehash of better scenes in other films. Before continuing, I’d like to take a moment and discuss the two couples in Bone Tomahawk. More specifically, the age gaps between the actors involved are unsettling (though predictable). Russell is 66 years old, and Hunt’s wife Lorna is played by Kathryn Morris (48). She only appears briefly, yet it’s still a noticeable gap. Wilson is 43 and 20 years older than Simmons (23). I’m calling this out because it’s so normal. It would be more surprising if Lorna was actually played by an actress in her 60s. Thankfully, the early scenes are merely a set-up for the moment when Hunt, Chicory, Arthur, and Brooder set out to rescue Samantha and another settler. Zahler’s direction and writing immediately feel more confident in this setting. The pace remains deliberate, but it’s easy to spend time with these actors. Russell and Jenkins are sharp as expected, and Fox surprises in a role that is more nuanced than I expected. Wilson has a challenging role of hobbling around behind the others, but he injects Arthur with a determination that’s easy to respect. What sets this story apart from a typical Western is the way Zahler depicts the enemies. They’re often called “savages” and would be Native Americans in a lesser film. Instead, the troglodytes feel like a mix between people and sub-human animals. An eerie whistle signifies their impending arrival, and there’s no way to stop them. This sound plays a larger role because of the lack of a typical score in this film. We’re out there with the characters and helpless to save them. The slow capture of Hunt and Chicory is horrifying because it’s so slow and unstoppable. Zahler takes a slow-burn approach, which gives us time to understand the characters. It also helps to increase the tension, particularly when intruders unexpectedly appear. There's little of the openness you might expect from a trip into the wilderness. Instead, Zahler builds a claustrophobic feeling that only increases as the guys draw closer to the troglodytes. The payoff is mostly worth the time, though it still feels a little padded at 132 minutes. The long journey obviously recalls John Ford's The Searchers, though the final destination is quite different. There’s one moment that pushes Bone Tomahawk into a different realm, and no one will forget it. The violence is so over-the-top that it’s nearly laughable, but it doesn’t move into camp. Shot in close-up, Russell’s face reveals a horror that drags us back into reality. The workmanlike way that the cannibalistic troglodytes execute their jobs adds to the queasy feeling. There are no clever quips or mustache twirling to let us off the hook. We’re stuck inside that cage with Hunt. It’s an inconsistent but incisive debut from Zahler, who’s a filmmaker to watch. Working with a limited budget, he creates a vivid world that’s safe for no one, including the audience. Bone Tomahawk is currently streaming on Amazon Prime. Squeamish viewers should look elsewhere. By sheerest coincidence, I grabbed a copy of this from the library the other day and just watched it. It's not one I think I'll watch again any time soon. Not because it isn't worth watching but because it's a harrowing journey. I agree that there's a slowdown once we get to the town, but I think that's necessary to introduce the characters. It's a bit clunky, admittedly. Zahler may be more at home with the brutality of the third act, which is unflinching and terrible. It's a hell of a directorial debut. I think you're right that Zahler doesn't care as much about the introduction. That's probably what I sensed at the start. It definitely seems like he's more at home in the grisly third act. He did write a low-budget horror film called Asylum Blackout that looks pretty gruesome from what I can gather. He's quite a confident filmmaker especially when shooting the violence. I don't think I'll revisit it for the same reasons as you.